The world's greatest sensitivity and ultra-fast technologies found in the LCMS-8060 are now available for the LCMS-8045/8050. The LCMS-8050 Upgrade Kit includes three key components. Upon installation, the LCMS-8045/8050 will deliver LCMS-8060 performance. The new UF-Qarray was designed to maximize sensitivity without compromising robustness or changing the minimal noise performance established in our previously patented Qarray. 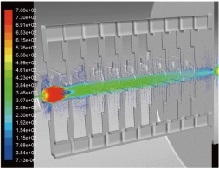 To optimize the design of the UF-Qarray, a number of simulation studies were carefully conducted using two platforms to model ion behavior under increased gas flow in the low vacuum region. 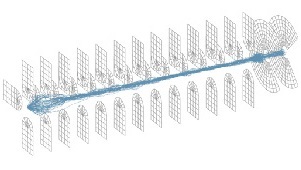 FLUENT software was used to determine which pole shape would maximize ion focusing under gas flows generated by the enhanced pumping configuration (Fig. 1). The second technology, newly developed Optdesign modelling software, was used to analyze the complex behavior of ion trajectories when voltages are applied to the expanded ion cloud (Fig. 2). Using FLUENT and Optdesign simulation models, several prototypes were developed for testing, which led to the UF-Qarray pole geometry final design. This design ejects neutral gas particles in order to reduce noise while achieving greater ion focusing than the previous Qarray design. With the newly designed UF-Qarray, improved ion focusing efficiency results in greater signal intensity and a reduction in noise. 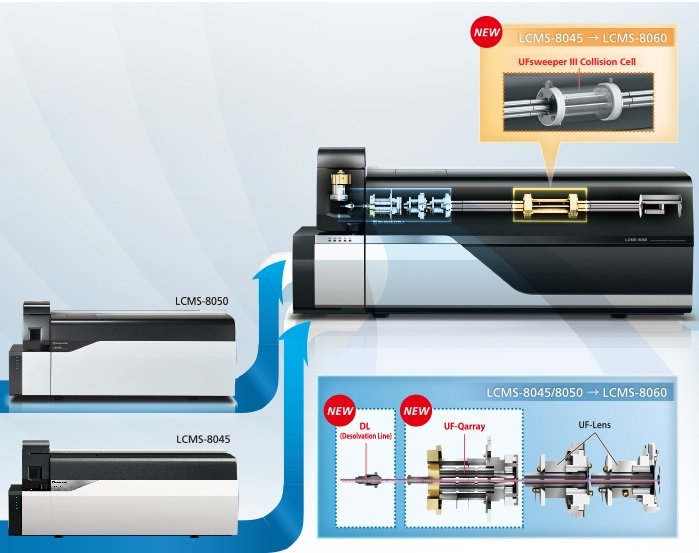 By improving the ion sampling device (desolvation line) and the ion guide (UF-Qarray), and enhancing the vacuum efficiency, the LCMS-8060 defines sensitivity. These new technologies allow for improvements in sensitivity and robustness in all acquisition modes.